Nature has spent the last few billion years refining its techniques for how things go together and why they come apart, and certain principles have held up. In fact, we see self-similarity across scale, from the nano to the galactic. We see that tension-integral systems in sacred geometries are the most stable, always. So, we figure there might just be something to learn from that. GuildWorks' design inspiration comes from our understanding of these structures in nature, and their inherent synergies throughout the universe. On the sub-micro scale, particles orbit one another in a tensional network of subatomic forces. Atoms arrange themselves in sacred-geometric patterns, most obviously in the crystal lattices of the strongest and often most beautiful materials. On the macro scale this can be seen in planets, solar systems and galaxies with the orbiting gravitational pull (a tensional force) keeping the whole picture in stable balance. Even on the human scale, science has shown cells to be tension-integral structures along with the muscular- skeletal system of the human body. Why are tension systems found everywhere? Because they are the most efficient way for the universe to build. To see this for yourself, take a long line and stretch it across the yard. It will hold tight, almost no matter how far you stretch it; even across the block, you can get that same line to hold tight. Now take a small stick, find the longest one you can, tape another to it to extend its length. You will find you cannot make it very long before it breaks of its own weight when used as a compression structure. This is because compression forms take to bending and each joint in multiplication weakening the structure. So the more we can build in tension, the stronger and lighter we can build our structures. By building in the way nature builds with tension-integral systems, GuildWorks is able to do more with less. This is, in part, the basis of synergy. Synergisticly we can use fewer materials to accomplish a greater end result. Building anything at this moment on earth it is crucial that we use fewer resources to accomplish more. Tension structures and tension fabric structures are the most efficient means of building we have available. GuildWorks' goal is to expand the use of these structures in all areas. This way we are doing what is best for the earth and for our collective future. ​What is Architecture of the Air? 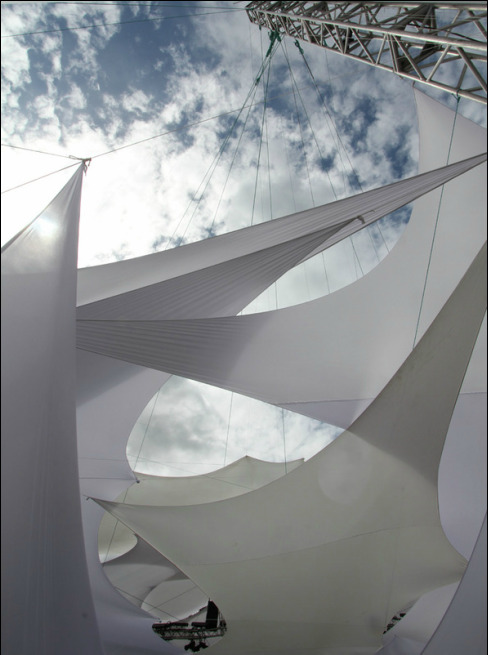 Architecture of the Air is really the best choice of words to describe what we do with fabric in all forms. GuildWorks utilizes state-of-the-art fabric materials to create inspiring, dramatic, practical, and elegant architectural spaces as well as unique one of a kind creations. Our amazing tension-fabric designs may be utilized for a wide variety of applications. 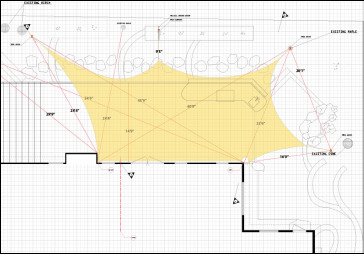 Visit our main site, GuildWorks.com to learn more about our signature fabric architecture works.